Charles Manson, dead at 83, weaponized the 1960s. The now-deceased cult leader weaponized the zeitgeist to make himself famous. Now he’s dead, but because of us, his fame will live forever. Any honest accounting of the cultural legacy of the 1960s has to reckon with Charles Manson, who died Sunday at the age of 83. Manson was a human monster whose sole talent was being able to identify the most loathsome potentials of that decade’s zeitgeist and bend them to his own hideous will. He was a terrifying mix of violence, sexual exploitation, and virulent racism, a narcissistic psychopath who used and abused everyone in his path and dedicated his own life to the destruction of others’. In 1969 he devised two nights’ worth of unfathomable slaughter, committed by his followers at his behest, and in so doing obtained the only thing he’d ever wanted: celebrity. Charles Manson embodied the very worst of his era and, to no small degree, every era since. Born in Cincinnati in 1934, Manson’s early childhood was defined by abuse and neglect, the worst possible environment for a boy who exhibited signs of severe personality disorder from a young age. He spent his teenage years in and out of reformatory schools and detention centers, where he was both victim and purveyor of all types of abuse. He married twice during the 1950s, the second time to a 16-year-old whom he’d been pimping, a union he used to preclude her from testifying against him for passing bad checks. Manson was a masterful manipulator of people, a man with a preternatural ability to spot weakness in others and exploit it for his own ends. In the early ’60s, Manson learned to play guitar in prison, and as that decade roared on, he began harboring ambitions of becoming a rock ’n’ roll star. From a musical standpoint, Manson was a talentless fraud whose interest in rock ’n’ roll was entirely inseparable from his desire for fame, money, and power. He was, of course, neither the first nor last to fit that particular description, but his quixotic ambitions quickly bled into delusions, evidenced most prominently in his growing obsession with the Beatles, whom Manson came to view as equal parts inspirations, professional rivals, and psychic interlocutors. By the time Manson landed in Haight-Ashbury in March of 1967, he was 32 years old and had spent more than half his life incarcerated. In both age and background, he seemed an unlikely fit for the approaching “Summer of Love.” But Manson saw the hordes of young people descending on the Bay Area as vulnerable and searching for meaning, and thus as easy prey. He deftly exploited the moral and ideological gray areas of the counterculture and set about building a following. Manson drew from his years of experience as a pimp to use violence, drugs, and promises of protection to lure and control women; he then used the sexual promise of those women to lure and control men. For young people desperately searching for utopia, Manson instead gave them something closer to hell, then convinced them it was everything they’d ever wanted. Throughout this period, Manson honed and preached his theory of “Helter Skelter,” a coming race war in which black people would rise up to violently overthrow whites, only to be finally ruled over by Manson and his followers. Frustrated that his prophecy was not coming to pass, Manson decided that he and his family should jump-start Helter Skelter by murdering affluent whites and making the crimes appear racially motivated. Thus, in perhaps the most sickeningly American twist of a most sickeningly American story, seven of the most gruesome killings in modern history were committed with the goal of framing black people for murder. It was under these convoluted auspices that four of Manson’s followers went to 1050 Cielo Dr. on the night of Aug. 8, 1969, and murdered 26-year-old actress Sharon Tate (who was 8½ months pregnant) and four of her houseguests. The following night, the family murdered supermarket executive Leno LaBianca and his wife, Rosemary, a dress store owner. The method by which Manson chose his victims was both self-obsessed and grotesquely mundane: Tate lived in a home that had previously been occupied by music executive Terry Melcher, whom Manson believed had disrespected him, while the LaBiancas resided next door to a house where Manson had attended a party the previous year. I didn’t live through the ’60s, but I recently wrote a book about them, and even from a distance, it’s remarkable how fast everything seems to happen, how quickly coincidence comes to seem like portent. Only five days after Manson and his followers completed their killing spree, 400,000 people convened in the Catskills for the Woodstock Music & Art Fair, “Three Days of Peace & Music” that stretched into four. Just a few months later, the horrific motives behind the murders were just beginning to leak out to the national press. “Manson ‘Black Magic’ Told by Ex-Followers,” read a front-page headline in the Los Angeles Times on Dec. 5, 1969; the article included ominous excerpts from Manson’s song lyrics. The following day, the Rolling Stones played a free concert a few hundred miles north of Cielo Drive at Altamont Speedway, where 18-year-old fan Meredith Hunter was stabbed to death by a member of the Hells Angels. The day after that the Los Angeles Times published another headline: “KILL WHITES, PUT BLAME ON BLACKS: Manson Wanted a Racial War, Friends Say.” I remember that no one was surprised. The afterlife of Manson and his family has been a twisting and powerful one. 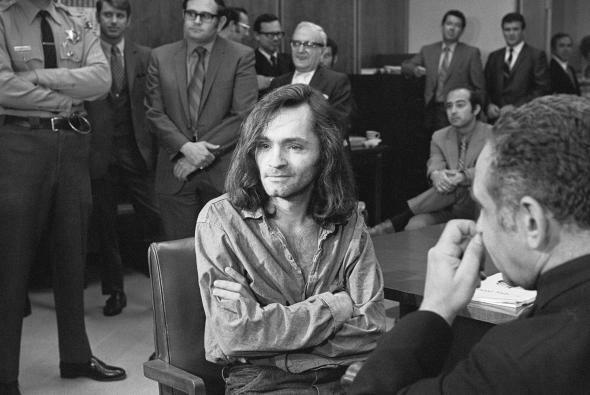 In 1974, prosecutor Vincent Bugliosi published Helter Skelter: The True Story of the Manson Murders. It was the most sensational work of American true-crime writing since In Cold Blood and remains the best-selling book of its kind ever published. That same year, Sharon Tate’s widower, Roman Polanski, released Chinatown, a hardboiled and paranoid vision of the birth of modern Los Angeles that to many viewers felt like both an excoriation and an exorcism. In 1975, one of Manson’s followers, Lynette “Squeaky” Fromme, attempted to assassinate President Gerald Ford. By the end of the decade, punk and its offshoots were embracing Manson’s image in quasi-ironic ways, sapping him of his terror but enhancing his celebrity. And every panic over rock music’s effect over wayward white youths in the years since has born the traces of the Manson family’s legacy, from 1980s freakouts over Satanist messages in heavy metal records to the prurient late-1990s scapegoating of namesake Marilyn Manson and other artists for their alleged “role” in the Columbine massacre. Charles Manson made himself famous, but all of us kept him that way. Now he’s dead, and we’re what’s left.